If turkey wraps or a ham and cheese on a roll are your go-to lunch staples, it might be time to re-think what’s going on between the bread. Cold cuts fall into the category of processed meats. Processing occurs when meat is cured, smoked and possibly injected with hormones before being marketed as lunchmeat, bacon or hot dogs. Processed lunch meats also contain an array of meats and meat byproducts that might otherwise be thrown away. These meats also have very high sodium contents as well as potentially cancer causing nitrites used to preserve them. There is also a high presence of E.coli and listeria found in cold cuts. Using fresh turkey, chicken or beef in your sandwich can be a much healthier alternative to cold cuts. Once again, eating “real food,” instead of it’s highly processed and packaged counterpart is a much better choice. What does your yoga mat have in common with your lunch? Answer: If your lunch includes commercially baked bread, the answer just might be azodicarbonamide. This compound, often used to improve the texture of dough, has been shown to cause respiratory issues in factory workers who were exposed to high levels of azodicarbonamide. There is no indication that small amounts, like the amount found in bread, is actually harmful to ingest. The fact that it is used in rubber products from yoga mats to flip flops was the red flag for many health advocates. The compound makes the rubber lighter and more flexible. Many food products benefit from the same type of aeration, such as pastries, pizza, bread products and tortillas. Subway was the first of many companies to be called out on the use of azodicarbonamide, and urged to find an alternative. While we fully support taking any chemicals out of our foods, there are far more potentially lethal additives, such as BPA and potassium bromate to contend with. The best line of defense in protecting yourself and your family from harmful food additives is to eat fresh foods, and avoid processed and packaged foods wherever possible. The weather in New York has been cold and miserable. Last night’s blizzard left us thankfully unscathed, but we are in the mood for hunkering down at home. 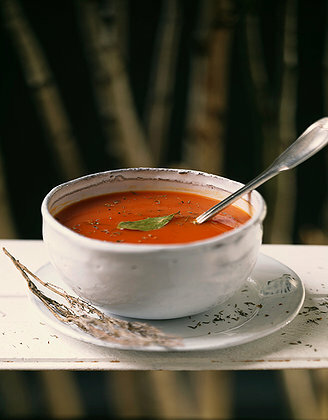 What is more soothing on a lazy winter night than the all-American classic, tomato soup and grilled cheese? This simple soup has few ingredients and lots of taste. The grilled cheese croutons offer an unexpected twist. It is quick enough for a weeknight meal tomorrow’s lunch, with a little Parmesan cheese, instead of the croutons. Saute a diced onion and a few diced cloves of garlic in olive oil until soft and transparent. Add about 52 oz. (2 tetra packs or large cans ) chopped tomatoes and about 36 oz.vegetable or chicken stock. Season to taste with salt, pepper, and herbs. I added a bay leaf, and some cayenne pepper for a little heat. Oregano and basil are also nice touches. It’s an unrecipe…use whatever flavors you like to season the soup. Simmer for at least 20 minutes, stirring occasionally. Puree the soup at return it to the pot. Taste and adjust seasonings. Add a little cream to the soup if desired. Enjoy with grilled cheese croutons. Butter the bread of your choice. Fill sandwiches with cheese. Gruyere adds a sophisticated jolt of flavor, but good old cheddar is fine too. A used a shredded 4 cheese blend that I had on hand. Grill the sandwiches on both sides until they are golden brown, and the cheese is melted inside. Cut into 6 or 8 squares and serve in the soup.